The first year you study the basic programme either social or technical science. The next two years of studies are called "the common subjects". 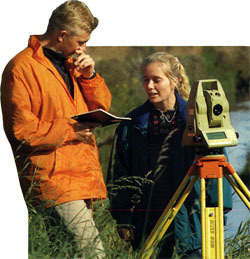 You obtain the necessary basic knowledge of surveying, mapping, registration of real property, land use administration, planning, cadastral work and environmental management. These practical subjects in the course, where you learn how to survey and use the different instruments, make out about half of the educational time. Theoretical subjects like law and planning make out the other half of the common subjects. During the last two years of your education you choose a speciality, i.e. you decide yourself which subjects you wish to emphasise in this versatile education. It is an advantage that you want to combine theory and practice, mathematics and law, technology and design as well as planning and administration. You will also work both indoors and outdoors and with both oral and written communication. As more than half of the educational time is group project work, you therefore learn the art of co-operating. Most textbooks are in Danish. However, you get the possibility of practising your foreign languages, if you want to go for a study trip abroad.